Service à la clientèle exceptionnel! J'ai commandé un magnifique sac en ligne et j'éprouvais de la difficulté avec le site WEB (lors du paiement). 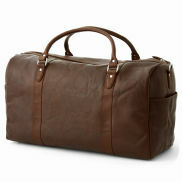 We offer a wide selection of bags for men, specializing in leather bags. We provide bags made with 100% cowhide leather of the highest quality. Use the menus below to find your special bag. Here you'll find our vast selection of bags for men. At Trendhim, we've put together a collection of beautiful, sharp-looking carrying cases. We're confident you'll like what you see. Because bags should not only look great but also serve functional and practical purposes, we've assembled a wide range of types and sizes so that you find the right one for you. Please consult our sizing guide (below, to the right) to help you find the right size to accommodate all the things you need to carry around with you (laptops, tablets, smart and mobile phones, chargers, documents, books, etc.). Our selection features bags made with either 100% leather, sturdy canvas, or a combination of both materials. Some bags are specially made for work or school. Others can serve more than one purpose, including weekend use, sporting gear, or holiday packs. The dropdown menus at the top of the page will help you find your way to the perfect bag for your needs. You can search by color, material, brands, and, of course, pricing. In order to properly maintain your bag, it's important to know what material it's made from. Canvas is a material often made from linen yarn. Cotton is also used in many of the bags. These flax materials are amazingly strong, thus making canvas bags very rugged and durable. Penetrating sprays or liquids are not required for canvas. To clean most stains, your best bet is to stick with hot water. More stubborn stains can be handled by scrubbing them with a mild detergent and water mix, using an old toothbrush. Avoid using bleach. We also don't recommended tossing your bag into the washing machine. When properly maintained, a good quality leather bag can last a lifetime. Here's what you need to know when it comes to taking care of your leather bag. In the image below, notice that we provide the height (X), width (Z) and depth (Y). The size of your laptop and bag. Naturally, it's important to get the size right when selecting a new bag. A good rule of thumb is to add 2cm (0.79") to the width and height of your laptop to ensure it fits well in the bag you choose. For example: if the width (Z) of the bag is 32cm (12.6") then your laptop should be no more than 30cm (11.80") in width. The same calculation also applies to your laptop's height. A weekend bag, as the name suggests, is a practical bag that can hold everything you need for a few days away from home, whether it's a weekend getaway or a short holiday. A weekend bag is basically smaller travel luggage. For men, we recommend a shoulder bag, which is a little bigger than the kind of bag you'd use for work.